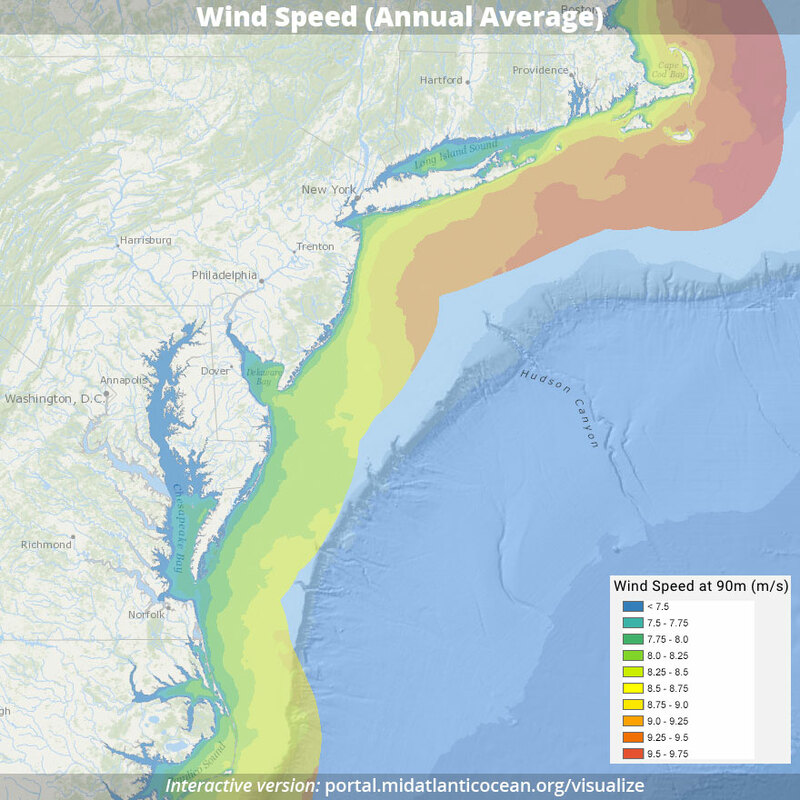 Development of renewable ocean energy facilities is expected to occur in the Mid-Atlantic. Conventional energy development has also been under consideration for federal waters off Virginia, Maryland, and Delaware. Renewable sources of ocean energy include offshore wind farms and marine hydrokinetic facilities that generate electricity from waves, tides, or currents. Conventional energy refers to sources such as oil and gas. While the United States does not yet have any operational offshore projects, multiple projects are in the planning and leasing stages in state and federal waters around the country. Because of the Mid-Atlantic’s reliable offshore winds and the gradual slope of the continental shelf, offshore wind farms are the primary type of renewable energy facility under consideration for development in this region. In federal waters, the Bureau of Ocean Energy Management (BOEM) has the authority to issue leases, easements, and rights-of-way on the outer continental shelf for the purpose of renewable energy development (BOEM 2015). 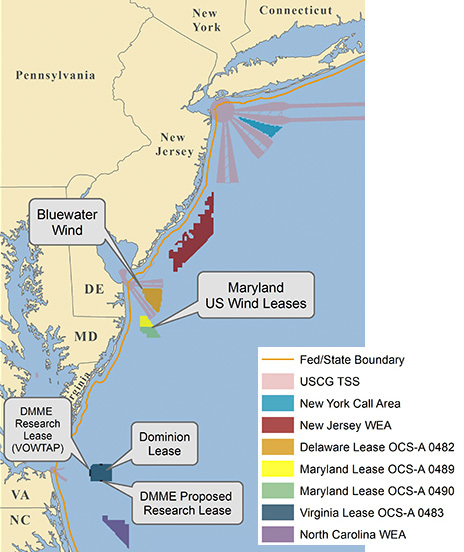 In the Mid-Atlantic, BOEM has leased areas for commercial development off the shores of New Jersey, Delaware, Maryland, and Virginia. In 2015, BOEM was in the process of identifying an area for leasing consideration off the shore of New York and was considering a research proposal off the shore of Virginia (BOEM 2015b). After winning a lease, the lessee has up to five years to conduct site assessment through installing and operating meteorological towers and buoys, and to submit a construction and operations plan. To date, no plans for commercial-scale development have been submitted for the Mid-Atlantic. Future offshore wind projects will likely be located increasingly farther from shore and in deeper waters, which will require new technology for turbines and infrastructure (Navigant Consulting, Inc. 2014). Approximately 90 percent of the U.S. outer continental shelf wind energy occurs in waters that are too deep for current turbine technology. The average turbine size for projects in the U.S. is expected to be larger (between 5.0 and 5.3 megawatts) than turbines that have been installed previously in European waters (Navigant Consulting, Inc. 2014). BOEM is currently considering a plan for two test 6-MW turbines offshore Virginia. Because no wind turbines have yet been installed in U.S. federal waters, little data is available on the environmental and siting effects of turbines and on the installation, operations, and maintenance of turbines. For interactive map, go to MARCO Data Portal and click on Renewable Energy > Wind Speed. At present, there are no active oil and gas leases in the Mid-Atlantic region. 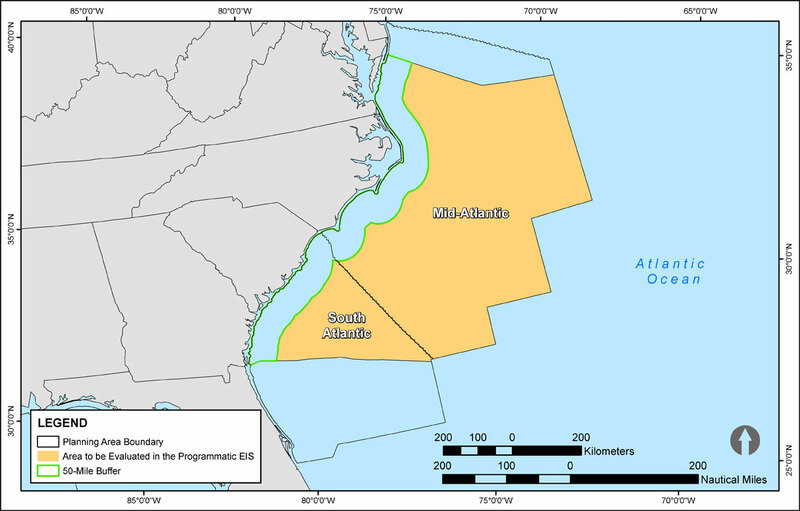 However, the Bureau of Ocean Energy Management 2017-2022 Outer Continental Shelf Oil and Gas Leasing Draft Proposed Program identified an area 50 miles offshore Delaware Bay south to the Florida border for further analysis. The geological and geophysical information available for this area dates to the 1970s and 1980s. Further research and updated methodologies are necessary to inform future oil and gas development in those areas open for federal leasing.